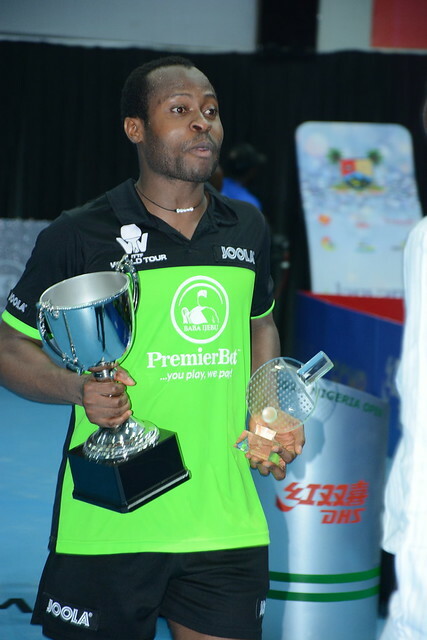 Positions in the main draw in the Under 21 Men’s Singles event at stake, as play commenced on the morning of Thursday 9th August, in the qualification tournament to reserve places in the 2018 ITTF Challenge Seamaster Nigeria Open in Lagos; the previous day the host nation’s Amadi Omeh had made his reservation, on the second day of action, colleagues Azeez Solanke, Jami Ayanwale and Tobi Falana followed suit. Success for local players but if the name of one country stood out, as it has done do many times in the past, it was China. First place in each of the seven groups was the only safe option for progress, the one further position being that of a “Lucky Loser” card drawn at random from those ending the day in second spots; the remaining three groups all witnessed pole positions for China. Moreover, in each instance at the expense of Nigeria. Wang Xingyang beat Emmanuel Augustine (11-7, 12-10, 11-9), Liu Jialiang accounted for Michael Obayomi (10-12, 11-3, 11-4, 11-4); likewise Wang Shaobo overcame Olasunkanmi Ogini (11-2, 11-4, 11-5). Three out of seven for China; in the initial stage of the Under 21 Women’s Singles, it was five out five. Similar to their male counterparts, there were no presents for their hosts, it was first place at the expense of Nigeria. Qi Fenjie beat Abosede Odusanya (12-10, 5-11, 11-4, 11-4), Wei Wensheng overcame Agnes Onoya (11-1, 11-2, 11-6). Similarly, Wang Shu accounted for Alimot Ayinla (11-4, 11-5, 11-5), Sun Chen proved too strong for Ajoke Ojomu (11-3, 11-5, 11-1); not required to raise a racket in anger, Guo Yan received a walk-over when scheduled to face Iyanu Filana. Five Under 21 Women’s Singles first places for China, the three “Lucky Loser” positions went to Agnes Onoya alongside India’s Maria Rony and Elodie Wan Kau of Mauritius. Play in the main draw commences on Friday 10th August.